After fire and smoke damage, it's natural for a person to want to clean up their building or home and its contents. A speedy clean up is essential in minimizing further property loss. 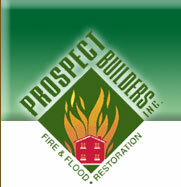 Prospect Builders can provide you with the expertise and experience needed for fire and smoke damage clean up to restore your home to its original condition. We're available 24 hours a day, 365 days a year for your emergency needs. We offer state of the art cleaning services for soot removal and board ups to protect your property. Our skilled technicians are ready for your call to mitigate water damage to prevent further damage from mold and mildew while we investigate your building for structural and smoke damage so that the restoration and reconstruction process can begin right away.In the event that your contents need to be stored, we can pack your items and track them until their safe return to you. Our goal is customer satisfaction. Our aim is to get you back into your home or business as soon as we can. Contact our qualified professionals today.